Ever since she was young, Paige McLean has longed to see the world. Still, she never imagined the world would land on her doorstep in the form of a charming British surgeon who needs a place to stay when his plans fall through. After a devastating loss, Alistair Woodbury has vowed to live his life alone. But in all his travels, he hasn't encountered a town as welcoming as Fool's Gold, nor a woman as caring—or as beautiful—as Paige. Her compassion warms him almost as much as their stolen kisses. When it's Alistair's time to leave, will his brief visit turn into a lifetime stay? 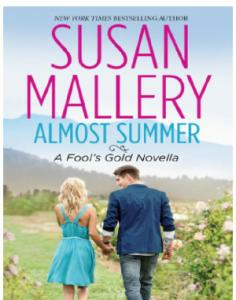 A Fool's Gold series novella. Hauwa1 Aug 2, 2018 6:18:49 PM Almost Summer	This book melted my heart so bad. I could connect to Paige and Alistair. I enjoyed d wit, shed a year, felt the warmth and all. Love is always the answer. Thanks so much Susan.